After a development that seems to have more problems than expected, and that has come with some month later than initially planned, adventure originally created by Nigoro is now available at Sony's handheld after passing by Wii and PC. As usual with such conversions, most likely you might be wondering if you have taken the opportunity to add content or contribute anything new, a question to which I already can answer "yes, but with nuances". Although we go to parties. 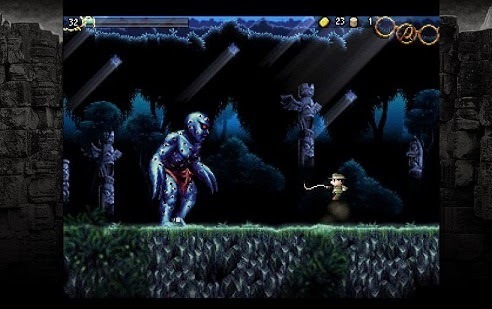 If you have never played before La-Mulana it is a platform 2D action game with a mapping in true Metroidvania style that forces us to explore every inch of the stage looking for secrets and possible paths. All while we are getting artifacts, items and weapons that we will open up new possibilities throughout the adventure. Among its features highlights the strong presence with puzzles, which lead us to search for tracks (very cryptic usually), to unravel its meaning and put them together with others to find the answer you seek. Furthermore, the levels are quite large and labyrinthine, so guide by the ruins of La-Mulana and discover how to move can become an ordeal. To all this we have to add a very high difficulty you will see the Game Over screen more than once in dozens of different ways, since neither foes nor traps have mercy on you. In fact, until life recovery system is intended to make us suffer. Here no potions or find objects that heal your wounds. This only able to do it in a very specific and limited or filling a special bar collecting the souls of dead enemies. When you complete this meter will automatically empty and your life will return to its maximum value. With respect to the controls, I have to warn that natural jumps are somewhat strange and rigid, so you will need some time to get used to them. Calculate where falling is relatively easy, the problem comes when we need to use this resource to other actions, such as hitting an enemy in the air while it is moving or to dodge an attack, which further helps raise the level of challenge of the work. Overall, this is a very fun and entertaining adventure that knows us feel like real explorers, provoke more frustration and reward our efforts and insistence with an unmistakable classic aroma. It already entering what its innovations compared to that seen in PC and Wii, commenting that have made some adjustments to its design to make it more accessible, smoothing thus hard early in its original versions, which practically never gave us a single indication of what we had to do or the functioning of its most basic game mechanics. Ojo, we have said more accessible, not easier, so you can rest assured that you will die many times as always. In fact, some puzzles have been slightly tweaked to make them more complicated, what we have achieved stuck more than once in places we never had problems on other platforms. Yes, the majority of the game has remained intact, so you also expect a redesign of all its enigmas. As a bonus we also find a new bestiary that will be recording all the monsters that go even eliminating the characters we meet on our journey. Besides giving us useful information on all of them, also will serve as a kind of art gallery, as it will allow us to see a lot of artwork that never seen before. Not that it's a particularly exciting added, but just adding to the whole. On the other hand, say that the graphics have not changed whatsoever, so still boasting that retro style 8-bit game so fashionable is from a few years ago between the independent studies, even when playing such a small screen pixels are better hidden, allowing to display a cleaner, sharper image. The bad news is that it has not taken the opportunity to adapt the game to widescreen (somewhat understandable given the level design without scroll and a fixed camera for each room). Regarding the sound, turn to enjoy a great soundtrack full of very catchy songs and perfectly acclimate adventure, so we recommend playing with headphones as not wasted. The sound effects and even get properly fulfill surprised at some time or another with very good details that help us even more to get into the gameplay experience.